Accost the Field — Great Horny Toads! In this episode of Accost the Field, Tony Gerdeman and Tom Orr talk about the best and worst thing they saw from Rutgers, then look ahead to TCU. What kind of problems do the Horned Frogs present? They also wonder if it is too early to completely buy in to quarterback Dwayne Haskins. All of this and much, much more, including listener questions. + Surprise, surprise, the Buckeyes are 2-0. + If you want to hear Rutgers talk, check out our postgame show. + What was the best thing we saw from the Buckeyes against Rutgers? + Now it’s time to see if the Buckeyes are as good as they look. + What was the worst thing we saw from the Buckeyes against Rutgers? + Will that worst thing linger? + Two games into the Ryan Day era, two QB records set. + Will there be a record this week? + Tom says absolutely and has receipts. + Eleven Buckeyes have scored touchdowns this season, which is the same number as the entire 2015 season. + Who does a defense focus on with this offense? + Which defender will be the next to score a touchdown? + OSU is completing 82.1% of its passes this season. TCU is allowing 40.2% completions. If Dwayne Haskins meets them in the middle, that’s good news for Ohio State. + A young Haskins going against a veteran defense. + How does Haskins handle the adversity and a mobile defense? + TCU gives up a lot of points to good offenses quite often. + Does Ohio State get to 40 points this week? + This is the measuring stick game, so it’s hard to project what is going to happen with confidence. 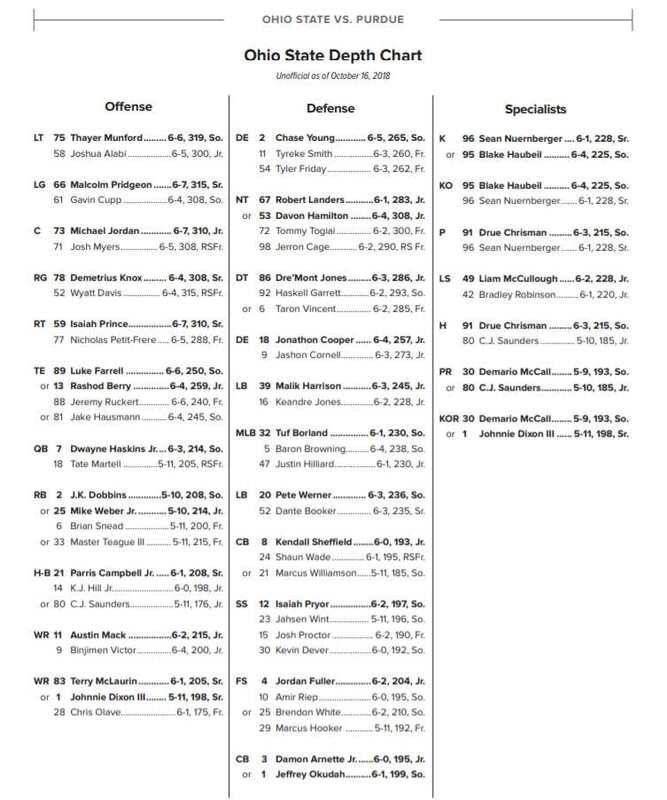 + Ohio State’s depth on offense and tempo favors them in a shootout. + Haskins has only “carried” the ball twice in each game this season — if he carries it twice against TCU, OSU will win big. + Where do we set the over/under on Haskins carries this week. + Is it okay to be all-in on Dwayne Haskins that he is THIS good? + This is going to be a stiff test for the Ohio State offensive tackles. + The TCU defensive line is a bit light, as is the rest of the defense. + Will Tate Martell play this week? + If he does play, that is a huge statement. + Will the Buckeyes have to throw to run? + If so, Ryan Day probably won’t mind. + How will the Buckeyes defend the first dual-threat QB they’ve seen this year? + The TCU offensive line is mostly unproven, especially at left tackle and center. + TCU QB Shawn Robinson is not the most accurate passer. + Where is the linebacker rotation that Greg Schiano has talked about? + How has OSU maintained this level of competence without Urban Meyer? + Given OSU’s size advantage on the OL, will there be heavy doses of the running game? + Will the Buckeyes set the OSU sack record this year? + What boxes has Dwayne Haskins yet to check? Is this his only year as Ohio State’s starting quarterback?